Published: Apr 26, 2016 to ? 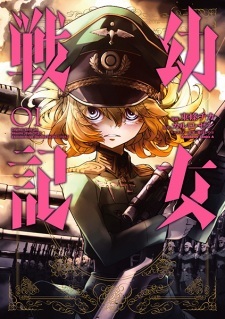 Youjo Senki has been published in English as The Saga of Tanya the Evil by Yen Press since February 6, 2018. To be very frank, the story ( or more precise , the plot ) is not the best thing about this amazing masterpiece. If you know even a bit about both World Wars , you can certainly predict what major events will happen. That being said, following the story of Tanya, the author managed to make the dangerous , boring and often very fucked up life of a soldier exciting , or at the very least , interesting to see, which is an amazing achievement. It's even more interesting to see that the main character of this manga has a lot of interesting inner-thoughts and beliefs, plus , seeing things that had happened in the past unfold in front of us and we already knew what would happen, this showed quite a promising premiere that is done brilliantly . (That being said , the manga didn't include quite a lot of expositions from the LN , but the artist still cramped as much as he could , which is also an amazing achievement considering the original novel proves to be very detailed , thorough and comprehensive. ). If you are a history-buff like me, or are interested in warfare in general , this manga is a hidden gem among the saturated, quite honestly pure trash sea of poorly-made light novels . (Me also being very interested in the Axis Powers and wars that has happened in Europe alike in general also helped with coping with the sheer information this novel/manga has). Magic and religion is also playing a huge role in this manga , and the author has made very interesting things regarding those 2 subjects. (If i go any deeper, that would be spoilers but I do intend to keep these spoil-free). BASED TOUJO CHIKA. This guy is freaking amazing . He has a highly-stylized that you can recognize from first glances , plus memorable facial expressions make his artstyle very noticeable , like a glittering gem at night. The gore-scenes , or fight-scenes in general, are done beautifully in a way that gives off an intense feeling of intimidation and daunt, while remaining extremely stylish and polished. I have nothing but praises for a talent like him. Tanya (aka Best girl) : The main character stands out to me as exceedingly wonderful. She feels extremely humane and well, possible. It makes senses how her personalities would be forged into what they are now , considering her environment and circumstances. It feels like it could happen to anyone , given the right conditions , and that's frightening. It's frightening how she is so cold , calculating and selfish, yet remains likable, wise and (somewhat) kind to the people around her. The moral-ambiguous nature of her personalities are the products of what happened to her , and that's what makes her so great . War is hell, this manga shows it very well, it's reasonable that the main character, who faces life-and-death situations many times, would be an anti-hero , or at least not innocent. You either die with your moral in-tact , or try and survive with all you have. Tanya carefully controls her fate as a soldier through cunning planning, wisdom and experience of her past-life as a guidance through life. For me personally, the more I read about her , the more I think i know about her, the more less i actually know about her. It's amazing how real Tanya feels , and she's definitely one of my favourite fictional character ever. Side-characters : There are varied of SCs here and there , and some of them, even with limited screentime, managed to grab my attention and become memorable while remain relevant to the story. It's quite amazing how I still remember about the non-commissioned officer who guarded Tanya's rifle and operation orb than I do about the main characters of most (dropped) light novels I've read, and he wasn't even that relevant to the story ! From the Brigadier , to the First Lieutenant when Tanya was transferred to the Western Front , every plot-relevant side-character have very unique yet realistic personalities that left you wondering if they are based off of real people. Once again , the author has outdone himself. Like i mentioned before, if you are interested in history, especially 20th century European history, and 20th century warfare in general , this manga is the magnum opus of this era's LN , the Citizen Kane of LN and Manga. It takes on a more realistic, exposition-heavy style that not many LN does (or tries to do), and it's heartwarming to know that such a talented writer and artist decided to tackle this project and bring it to life. I'm very pleased with this manga as it turns out , coming from someone who read the novel and had an almost impossible expectation. Story: The story isn't overly amazing but its far from bad. The story is set in an alternate reality in World War 1, but it starts around 10 years after our own WW1 so instead of WW1 happening in the 1910's its in the 1920's. The weaponry and out fits are very WW1 looking with some changes, but the biggest changes is the use of magic. I'm not going into more detail because of spoilers but the first few chapters sum it up. Art: The art is pretty damn good, its not Berserk or Uzumaki in terms of art but diffidently good. Characters: Now the only real character you'll like is the MC and maybe Viktoriya but its pretty much a hit or miss depending on if you like the MC. If you like the MC you'll enjoy this Manga but if you dislike the MC you'll dislike this Manga. Enjoyment: Personally I love this Manga. I love the WW1 theme, art style, and of course the MC. Fun fact its possible and not unrealistic for the MC to be in the war. They said in the manga the empire is gender equal when it comes to soldiers and in our own history children as young as 13! where soldiers in WW1!So having an 11 year old girl in an gender equal society fighting WW1 isn't that out there. Do you miss "Fullmetal Alchemist"? If so, I recommend giving "Youjo Senki" a try. Why do I say this? Keep on reading. Both series' have a very similar vibe where the setting of the story is loosely based off history, and takes place during a time of devastating war. "Youjo Senki" and FMA share almost the same vibes due to the focus and the point of view that its told from; with "Youjo Senki" focusing even more on the events and the historical implication of those events, and FMA focusing more on the "magic". "Youjo Senki" is more like a documentary. "Youjo Senki" is also a isekai story, but unlike alot of the ones that are coming out nowadays; it's much more enjoyable for a older audience. It has a lot of the classic isekai aspects like an OP MC winning all battles with information from the other world, or having some sort of attribute or ability granted to them for the purpose of making them special in their new world. In addition to being a well told serious story, the author finds appropriate places to inject some humor and it meshes nicely without disrupting the flow of the story. Just like how FMA became a classic must read/watch, I think "Youjo Senki" will become one too, and I hope that you will give this series a read.